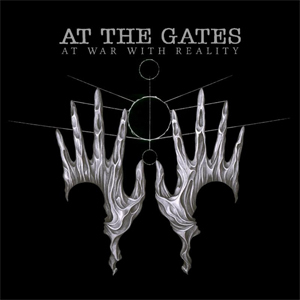 "Gothenburg style" melodic death metal pioneers AT THE GATES will soon release their anticipated At War With Reality comeback album, their first studio effort in 19 years. A first music teaser, featuring more of the stunning artwork designed by Costin Chioreanu (twilight13media.com) for At War With Reality, can be seen below. Due out October 27th in Europe and October 28th in North America via Century Media Records, At War With Reality features the band's classic line-up from their latest masterpiece, Slaughter Of The Soul (1995). AT THE GATES recorded At War With Reality with Fredrik Nordström at Studio Fredman (IN FLAMES, ARCH ENEMY, DIMMU BORGIR) and mixed with Jens Bogren at Fascination Street Studios (OPETH, AMON AMARTH, KREATOR). "El Altar Del Dios Desconocido"
"The Conspiracy Of The Blind"
"The Book Of Sand (The Abomination)"
"The Head Of The Hydra"